← Studio X arrives in Bombay! This post has been long overdue. Last month Bombay Brunch Brigade went to Busaba. I was looking forward to this brunch all month long as we had planned on going to Busaba in January but ended up skipping as most members of the brigade had their social calendar crowded with weddings to attend. My friend; the loitering lamb and I arrived on time at Busaba. Busaba is located besides Indigo behind the Taj hotel. We tried entering through what we thought was the entrance only to realize that it was the service entrance and as we stepped up to it the guard rolled up the shutters to reveal the main entrance. 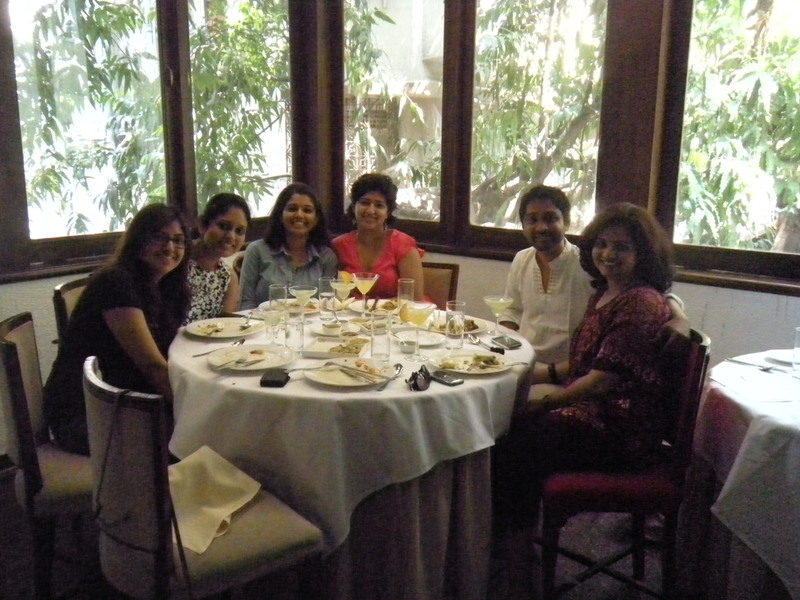 The place was deserted and we were escorted upstairs and our table was set up in an enclosed verandah at the back. My friend and I decided not to wait and make the most of brunch time so we went ahead and called for a busaba mary and a watermelon caprioshca. We also called for some grilled salmon sushi, mango sushi and some chicken momos. Soon enough the rest of the brigade began to trickle in. We ordered nearly the entire appetizer menu which included sushi, Korean pancakes, spring roles, satay, Momo’s and Banh Xeo. My personal favourite was the Banh Xeo, the Vietnamese pancakes, a rice pancake stuffed with bean sprouts, chicken and shrimp. Rohini was disappointed to learn that they did not have the BBQ spare ribs. We kept ordering drinks, we had the fresh orange and mint martini, pinacoladas and finally settled for some green apple margaritas. We also called for some shooters. They were not as much fun as the shot of buckets that we had at Indigo. It was time to call for the main course. Busaba is known to have brought the Burmese kaukswe(that is how they spell it) to Bombay. Amrita and I had to try the kaukswe as we both love the khause our mom’s make so we had to compare. The kaukswe was mild compared to the khause that my mom makes, Amrita felt the same as well. For desert we called for the Chocloate Fondant(Rohini skipped her main course and had two of these instead). I decided to get a lemon tart and it was not as zesty as a lemon tart should be. Despite slow service and not as attentive service we had a blast. We got pretty loud and at one point I did notice someone sitting right outside the enclosed verandah walk over and shut the door. Oops! After brunch we walked over to the promenade across from the Taj and enjoyed the cool sea breeze and the view of the Gateway and the ocean all around. Busaba has a new location that recently opened in Lower Parel across from Blue Frog. They do not have a brunch menu. This entry was posted in Culture, Fashion, Food, Travel and tagged Bombay, Bombay Brunch Brigade, Busaba, Colaba, Food, Gateway of India, Mumbai. Bookmark the permalink. I’ve always loved the idea of going out with a good group of friends. Sounds like you had a fun time. Looking forward to the next topic/restaurant.